40 years ago, in 1977 OSU researchers led an NSF funded expedition to the Galapagos on a hunt for suspected hydrothermal vents. 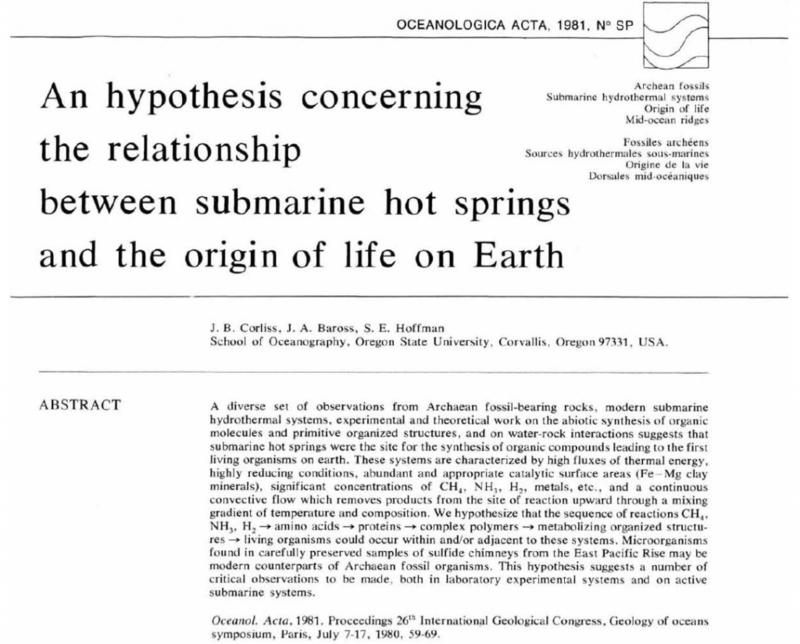 From the 1960s to the mid-1970s, mounting evidence such as (1) temperature anomalies found deep in the water column, (2) conduction heat flow probes at mid ocean ridges recording temperatures much lower than expected, (3) unusual mounds found on benthic mapping surveys, and (4) frequent, small, localized earthquakes at mid oceanic ridges, had the oceanographic community suspecting the existence of deep sea hydrothermal vents. However, until the 1977 cruise, no one had conclusive evidence that they existed. During the discovery cruise at the Galapagos rift, the PI (principle investigator), Dr. Jack Corliss from OSU, used tow-yos (a technique where you drag a CTD up and down through the water in a zig zag pattern – see gif) to pinpoint the location of the hydrothermal vent plume. The team then sent the Deep Submergence Vehicle (DSV) Alvin to investigate and returned with the first photographs and samples from a hydrothermal vent. While discovery of the vent systems helped answer many questions about chemical and heat fluxes in the deep sea, it generated so many new questions that novel fields of study were created in biology, microbiology, marine chemistry, marine geology, planetary science, astrobiology and the study of the origin of life. 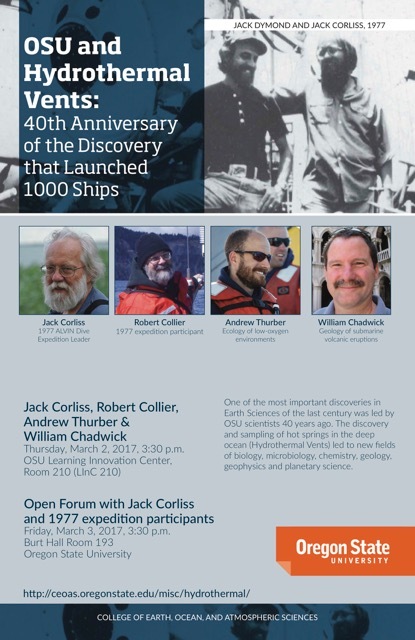 In celebration of this great discovery, OSU’s College of Earth, Ocean and Atmospheric Sciences sponsored a seminar looking at the past, present, and future of hydrothermal vent sciences. Dr. Robert Collier began with a timeline of how the search for hydrothermal vents began, and a commemoration of all the excellent researchers and collaborations between institutions and agencies that made the discovery possible. He acknowledged that such collaborations are often somewhat tense in terms of who gets credit for which discovery, and that while Oregon State University was the lead of the project, it takes a team to get the work done. Dr. Jack Corliss proudly followed up with a wonderful rambling explanation of how vent systems work, and a brief dip into his ground breaking paper, “An Hypothesis concerning the relationship between submarine hot springs and the origin of life on Earth.” Published in 1981, with co-authors Dr. John Baross and Dr. Sarah Hoffman, they postulate that the temperature and chemical gradients seen at hydrothermal vents provide pathways for the synthesis of chemical compounds, formation and evolution of ‘precells’ and eventually, the evolution of free living organisms. Some of the goals for this recent cruise included mapping new areas of the Mariana back-arc, and investigating differences in the biological communities between vents in the Mariana trench region (a subduction zone) and vents in the back arc (a spreading zone) to see if geology plays a role in biological community composition. For some very cool video footage of the expedition and the various dives performed by the brand new ROV SUBastian (because all scientists love puns), check out the Schmidt Ocean Institute youtube channel. Dr. Chadwick showed this video to highlight results from his last cruise. Finally, Dr. Andrew Thurber wrapped up the session with some thoughts about hydrothermal vents from the perspective of an ecosystem services model. Even after 40 years of research, there are still many unknowns about these ecosystems. Individual vent systems are inherently unique due to their deep sea isolation. However, most explored sites have revealed metals and mineral deposits that have generated a lot of interest from commercial sea floor mining companies. Exploitation of these deposits would be an example of ecosystem “provisioning services” (products that are obtained from the ecosystem). Other examples include the biology of the vents as a source of new genetic material, and the thermal and chemical gradients as natural laboratories that could lead to breakthroughs in pharmaceutical research. Cultural services are those non-material benefits that people obtain from an ecosystem. 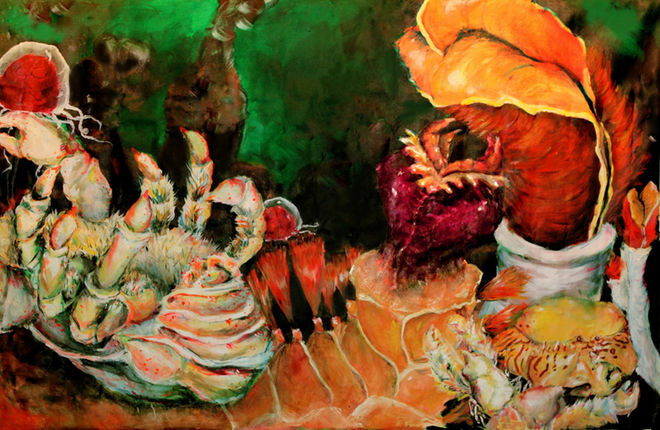 At hydrothermal vents these include new scientific discoveries, educational uses (British children’s television show “The Octonauts,” has several episodes featuring hydrothermal vent creatures), and creative inspiration for artists and others. Dr. Thurber cautions that there are ethical questions to be answered before considering exploitation of these resources, but there is a lot of potential for commercial and non-commercial use of vent ecosystems. As an undergraduate at the University of Washington, I spent time as a research assistant in Dr. John Baross’ astrobiology lab. We studied evolutionary pathways of hydrothermal vent viruses and bacteria to inform the search for life on exoplanets such as Jupiter’s moon Europa. It was very fun and exciting for me to attend this seminar, hear stories from pioneers in the field, and remember the systems I worked on in undergrad. I may have moved up the food chain a little now, but as we all work on our pieces of the puzzle, it is important for scientists to remember the interdisciplinary nature of our work, and how there is always something more to learn.